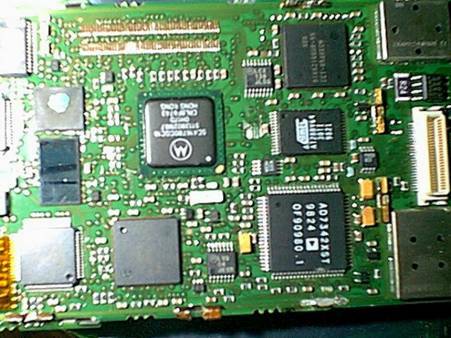 Disassembly of Motorola Iridium Telephone. After it was announced by the media that the Motorola Iridium system would be de-orbited I obtained an Iridium phone (very cheap, less than 1/100th of original cost) and proceeded to pull it apart. Now that the system is back going again I wish that the phone was still in one piece :-( However I thought that others might learn from my disassembly of the phone...thus this web page. � I snapped the connector off the base of the antenna. � To pull the antenna apart I simply placed a screwdriver in the gap of the plastic casing and prised it apart. 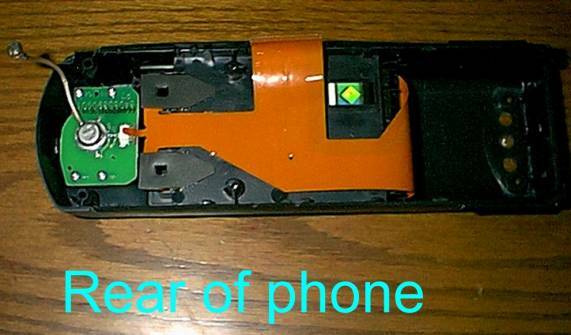 The end closest to the phone is the place to start otherwise the antenna insides may be damaged. The antenna unit is a clear plastic cylinder with "silver tracks" on it. The coax is coupled to the plastic cylinder. � The antenna is coupled to the coax using capacitive coupling? 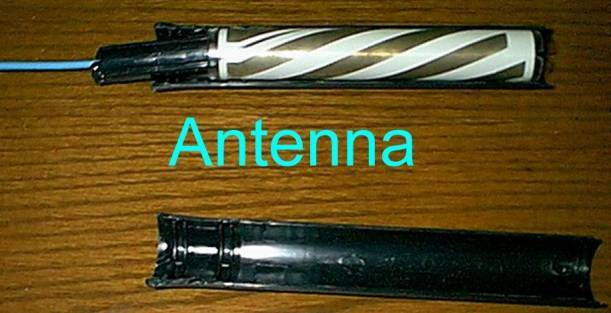 � The antenna is a quadrifilar antenna, constructed using a clear plastic cylinder and plated on "elements"
� The "elements" on the quadrifilar appear to be plated on silver. It looks like the silver has partly oxidized. � There is no preamp built into the antenna. is an air gap between them. The coax seems to have shield soldered on one side,core on the other. Above picture is quadrifilar antenna. The Iridium phone antenna looks similar to the Qualcomm GSP-1600 (used by Globalstar) antenna. I wouldn�t be surprised if the antennas are very similar in Globalstar units. � The batteries I received with the phone are Lithium Ion batteries. The battery pack is a small �box�. Batteries are 3.? Volt. � They batteries wrapping has lots of security holograms on them to state that they are Motorola original products. � The battery charger appears to be a switch mode device (very light). Can take 110 or 240V. Novel design means that it can take use straight or angled pins in mains voltage socket via a small slide on adaptor. � The cover for the battery compartment is constructed from thin plastic???mm. It can be easily flexed between two fingers. � Inside the back of the phone is a main wiring harness made from (Flat Plastic Cable) FPC. 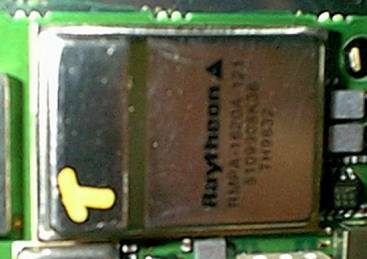 � A small PCB is found behind the antenna connector. It has several SMT components. The PCB at the LHS of this photo is mounted on the back of the antenna connector. The coax originally went to the main board. � Thick �silicone� type rubber keypad presses onto �bubble� type switches on PCB. � The SIM card is a full size ISO "credit card" sized card. The phone accepts the full sized cards. � When I acquired the phone it was missing the actual 'smartcard' portion of the simcard. � Appear to be a lot that can be done when the phone is powered up without the simcard. I tested it however when the system was in "bankrupt" mode. � The IMEI number is displayed inside the battery compartment. � The card I have has an Australian address etc printed on it. � VERY physically large capacitor (approx 60mm x 50mm x 10mm ) Has marked on it 48300 MFD 8.5 Volts. help? From looking at the Raytheon RF components web page it seems obvious that the RMPA component is the RF Power Amplifier. The RMLA is the RF low noise amplifier. The frequency that these devices are centred on is likely to be 1620Mhz. The RMPA-1620A-121 appears to have a LARGE number of pins. There are shielded cans on the back of the PCB behind the PA module. The large metal cover with the gold clips is the only one easy to remove. A soldering iron, screwdriver and desolder braid can be used to free this cover. Underneath are a load of chips made by various manufacturers Atmel, Temic, AD, Maxim etc. There is also a very odd shiny silicon chip. Instead of being made with a plastic or ceramic case the �lid� looks like it is made of glass! � These chips appear to be the "brains" of the phone. I guess that the AD7342XST is the DSP that handles the IMBE codec?? There are various Motorola SC.. chips that I cannot identify.. The photo on the left shows the The RMPA-1620A-121 module. View of a portion of the main board. It looks like this is the main processing area of the phone. � Are any service manuals for this phone available? If so what are the part numbers and where can they be obtained? � Are any service manuals for the Iridium pager available? If so what are the part numbers and where can they be obtained? � Is there anything interesting that can be accomplished by having an Iridium phone or pager without a subscription? Eg receive status reports from visible satellites etc?